What at first appeared to be some guerrilla filmmaking Down Under has turned out to be a particularly inspired bit of viral marketing. But unfortunately, it means that we won’t get to see Danny McBride play a didgeridoo this summer. Over the weekend, People shared a teaser for Dundee: The Son Of A Legend Returns Home, a purported sequel to the Crocodile Dundee franchise that starred Paul Hogan as a knife-wielding, Sheila-wooing crocodile hunter. It showed McBride in the role of Dundee’s American son, who has to rescue his father from the Outback (the region, not the steakhouse). It looked like a joke—complete with McBride slashing the air with his knife—so although the movie had a proper website and social media channels already set up, we waited for the other shoe to drop. Instead, we got another teaser for the film, this time with more Chris Hemsworth. With everyone’s interest now thoroughly piqued, Brisbane Times reports the whole thing is actually part of a viral marketing campaign for Australian tourism. If you’d gone through the film’s IMDB page, though, you had probably already caught on, since it listed a well-known director of commercials, Steve Rogers (no, not that one), as the helmer. 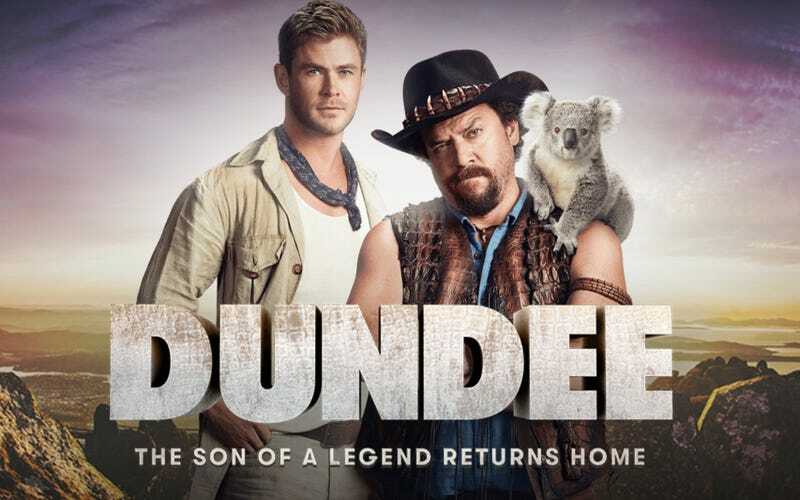 So, yeah, we won’t be seeing Dundee and Hemsworth trying to save a baby from a dingo, sadly, but in a sense, this is still a sequel. Hogan starred in Australia’s “G’day mate” ad campaign that undoubtedly drew tons of Americans to the continent, and now McBride will do the same.